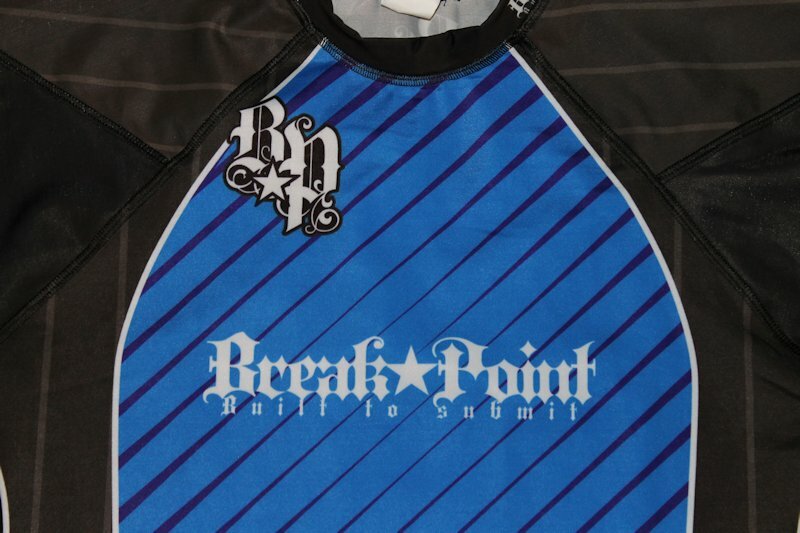 Break Point’s new series of ranked rashguards are available in short sleeves. The rashguards are IBJJF legal, available in traditional ranks, kid’s ranks, pink and red. 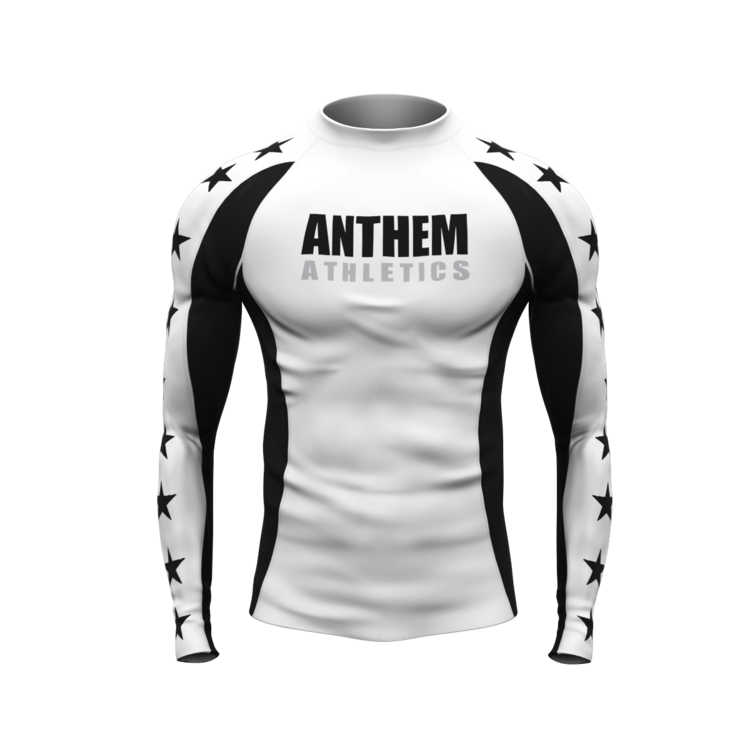 The rashguards feature fully sublimated graphics and are available for $49.95 from Breakpoint. The Blue Ranked Rashguard that I reviewed has black sleeves and sides with a very appealing pattern on the front & back. The rashie sports a medium blue in color with some diagonal coloring of darker blue to create contrast. White piping separates the ranked colors and black sleeves. I liked the overall look of the rashguard and it looks great with the sublimated Break Point graphics on the chest, each sleeve, and right below the neck on the back. As you’d expect the sublimated graphics have held up very well and I have not noticed any peeling or fading in the colors or graphics. The rashguard is constructed of polyester with 4 way stretch throughout the design. The neck cut is a little tight on me but that may just be due to my thicker neck, the tightness is not constricting. The arms fit well but the chest seems a little tight. Overall it fit very well and I like the cut. The flat stitching has held up great with only very slight fraying at the areas where two lines of stitching meet up and overlap. The tight fit helped with the rash guard riding up during class and I only seemed to notice a few times when it did ride up. The rashguard that I reviewed was a large, and fit me well thought on the tighter side. The website notes all sizes by body weight and if you are on the border of sizes you may want to go up a size if you prefer/need a looser fit (I’m ~185). This may be why I found the neck and chest a little tight. All of these rash guards are NABJJF and IBJJF approved and are also made in the USA. At $49.95 these moderately priced Rashguards are worth the money. 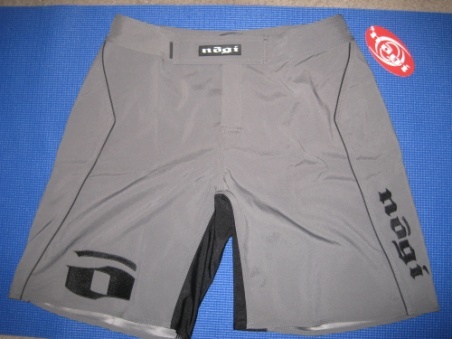 With a cool design and good fit you will be able to add this to your arsenal of jiu-jitsu gear. Something that I’d like to see in the future is a rubberized hem at the bottom to keep the rashguard in place. That being said this rashguard will have a place in my current rotation of NoGi gear. The fact that it’s IBJJF/NABJJF approved and made in the USA are also big pluses to me. For more information on Breakpoint FC check them out at their website, Facebook, Twitter, Instagram and YouTube.